History is littered with upended industries and business models. This sort of destruction will continue, and taking a look at what the future holds can present interesting investment theses. Here’s what I think is on the horizon. A shift to self-driving cars will have monumental social implications and leave a number of battered industries in its wake. There have been tremendous advances in car autonomy over the past five years, and it’s happening at an accelerating pace. The benefits of self-driving cars are simply too compelling for these efforts to peter out. There will be roadblocks, but the major commitment and money invested in efforts to see self-driving cars through to reality will overcome them. 1. Fueling stations. There’s a good chance your self-driving car of the future will be electric. For many people, this means they have a fueling station inside their garage. It’s also possible that fueling stations will still exist outside the home, but they will be very different than they are now. Whether they sell gasoline or electricity, don’t expect to personally visit them in the future. Cars will automatically visit fueling stations, refill, and then return to your home. Eventually, cars might even refuel wirelessly. Location won’t matter as much, and there will certainly be no need for multiple fueling stations on valuable street corners. Gas stations make a lot of their money from selling cigarettes, lottery tickets and booze. What happens when this foot traffic disappears? 2. Car manufacturers, dealers, and for-hire service. It remains to be seen if the leading technology companies working on autonomous cars partner with the existing large car manufacturers or compete with them. Either way, major upheaval is on its way. 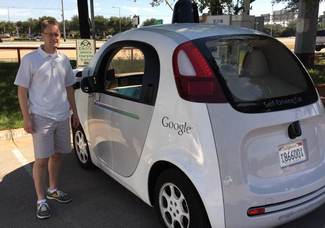 That’s me with a Google Car in Austin. If cars can drive themselves, does it make sense to own one? Why not just open an app on your phone and request a car, which shows up at your driveway within three minutes? People are already ditching their cars to use services such as Uber, which is disrupting the taxi business. Soon, the people making money with Uber will find themselves without a job, too. This is one reason Uber is investing in self-driving car research. Uber knows the days of operating a network of human drivers are limited. It will be easy to replicate its business model with self-driving cars, without the pain of recruiting and managing human drivers. GM just invested $500 million in Lyft, with much of the money earmarked for autonomous car efforts. The biggest expense of your Uber ride is the driver’s time, and that expense is going to go to zero. How low does the cost of traveling a mile in a for-hire car have to drop before it doesn’t make sense to own your own car? Or at least, that second car that doesn’t get driven much? I wouldn’t be surprised if Google adopts an ad-funded model for its fleet of cars, charging customers nothing. This will help it skirt many of the regulatory challenges Uber is facing by operating a for-hire car network. 3. Insurance. Gone will be the days of shopping around for car insurance to find the insurer that doesn’t seem to mind that you have a bad driving history or credit score. The current way insurance is rated will become irrelevant in the future. Assuming you actually own a car, car insurance might be provided by the manufacturer, bundled into a monthly service fee, or charged per mile traveled. No matter how it is sold, the actual cost of insurance will plummet. Accidents between self-driving cars will be much, much less common than with human drivers. Accidents that do happen will be less severe. 4. Infrastructure. I live in Austin, and we have a major travel infrastructure problem here. The city is growing like a weed, but highway expansion lags. The same goes for most of Texas. Yet missing from the state’s long-range planning for infrastructure expansion is the reality of self-driving vehicles. Simply put, capacity of existing roads will be much higher with autonomous vehicles. Self-driving cars won’t slow down to take a look at the stalled car on the other side of the highway. Nor will they needlessly tap the brakes, causing a chain reaction and delays. They can also travel much closer together because they’re in communication with the other vehicles on the road. You know that feeling of getting to the end of a traffic slowdown and wondering what the heck caused it? Your children might never experience this. It’s possible that infrastructure costs will increase at first because there won’t be an overnight change from human-driven to self-driven cars. Special HOV lanes for self-driving cars might come first. But eventually, the need to massively expand roadways will end. Self-driving cars are robots, and they aren’t the only machines taking over functions previously handled by humans — or that were previously handled by machines at great cost. A simple example has been around for awhile: the Roomba. Expect more robots like Roomba to take over daily tasks at your home and office, from mowing the lawn to cleaning windows. My neighbor found a drone with a high-resolution camera stuck in a tree on his property the other day. Is our space private anymore? Speaking of cameras, it’s now possible for people to buy a doorbell with a video camera better than a high-end camera from a decade ago. Home surveillance cameras are now affordable. Your nightly stroll through the neighborhood is probably captured on multiple cameras. Norms about what is acceptable surveillance and recording are changing. Google Glass set off a fierce debate, but the reality is we’re already being recorded. Your cell phone tracks your position. New cars often come with an app that lets you track their every move. Add in abundant video cameras, and an expectation of privacy is being eroded. Do the benefits outweigh the costs? How will society respond? Entertainment, particularly music, has been a poster child of an industry upended by technological change. Whereas homes used to have one or two screens, many now have over a dozen: phones, tablets, Kindles, laptops and TVs. I purposely list TVs last, because the percentage of time spent viewing a TV screen compared to other screens is dwindling. TVs are great for watching an action flick or football game, but their importance in entertainment will decline over the next decade. 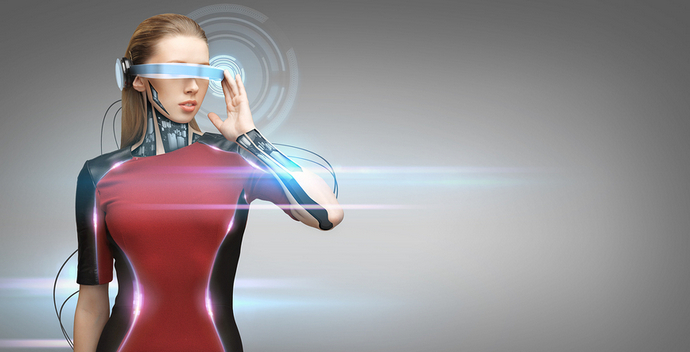 A new type of screen will soon enter reality — Virtual Reality. While Virtual Reality (VR) has been around in some form or another for decades, this year we’ll see a much-hyped headset from Oculus Rift. People who have tried it rave about it. But the same can be said for 3D television and film, which recently had their second coming. Interest in 3D has waned again (unless it’s the printing type instead of the 3D associated with funny glasses). Is VR a gimmick or the future? Radio is holding on, but just barely. The days of listening to radio transmitted via towers are certainly limited. Over-the-top internet radio is coming to cars, and there’s little reason to assume it won’t replace costly traditional radio stations. What will happen to Sirius XM? If radio transmitted from local towers seems silly, then certainly launching a satellite into space to provide radio is asinine. If Sirius is around in 10 years, it won’t be delivered via satellite. It will be a content play like NetFlix, delivered over the internet. How important is the role played by banks in our financial system? Certainly, some of their existing functions are becoming obsolete. The future will see much disintermediation in banking. Already, consumers can borrow money funded directly by other consumers on platforms like LendingClub. Banking laws, which will be slow to adapt, still make this a bit cumbersome. But there are great benefits to borrowers and savers by cutting out the middleman, so expect continued pressure to allow direct lending. Also, expect the number of bank branches to decline. There are very few bank functions that require an in-person presence anymore. First it was getting cash from ATMs. Now depositing checks via mobile phone is commonplace. There are banks with zero branches, where all transactions are handled over the internet or phone. That’s a lot cheaper than building a physical bank on expensive real estate. Blockchain technology also has big promise, even if it’s not in the form of bitcoin. It’s amazing how norms can shift over time, isn’t it? All of us minimum-wage workers snickered behind her back. What kind of Greenpeace nutjob was she? Now it’s the norm for consumers to bring their own bags to the grocery store. Many cities have passed laws prohibiting plastic bags. Governments and society seem hell-bent on going green. While oil firms pump record amounts of oil from U.S. wells, the expansion of solar and wind-derived energy is exploding. Subsidies have a lot to do with this, but the cost of these alternatives will drop in the coming decades, making energy less expensive and greener than ever. That crazy green lady at the grocery store wasn’t the only person we all laughed at that is now mainstream. Just five years ago potheads swore that marijuana would become legal. Most of us laughed. Five years later, marijuana legalization has become the expectation. A new industry is being born (or legalized) right before our eyes. This could have major ramifications for the large underground drug market and the violence and imprisonment that comes with it. For the most part, violence also continues to decline. We live in the safest, least violent time in history. Yet fear of violence remains extremely high. The fear of terrorist acts will continue to keep security services based on security theater will be in high demand. The future is indeed bright and full of opportunity. It also comes with challenges, especially for people and companies that can’t or won’t adapt to change.